What started out as a grassroots backyard monitoring effort has quickly developed into a large, complex and comprehensive research program. From hydrocarbon testing on the Kenai River to Peninsula-wide culvert assessments, KWF continues to expand and enhance our research efforts. We strive to provide quality data. This program provides an invaluable service to the entire Kenai Peninsula. 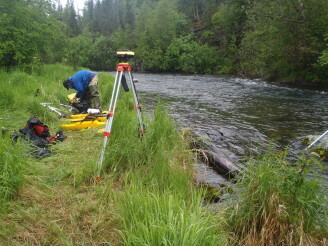 KWF employee surveying near the Russian River falls, near Cooper Landing, Alaska. 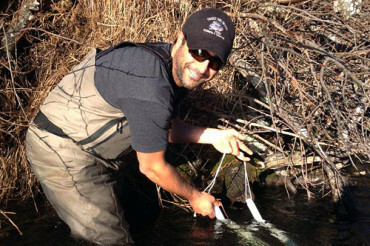 KWF employee collecting water quality data. worked together to protect watershed health last year.